When you need protection from the cold, wind and rain, this Weather Brake slips into place fast and easy. It provides the warmth & protection from the weather and is also designed to pull the heat from the engine back up into the operator area. When you need protection from the cold, wind and rain, this Kubota B-Series Weather Brake slips into place fast and easy. It provides warmth & protection from the weather and is also designed to pull the heat from the engine back up into the operator area. This custom fit Weather Brake is tailored to the make and model of Kubota B-Series tractors for a tight fit - allowing the engine heat to efficiently flow to the cab area. 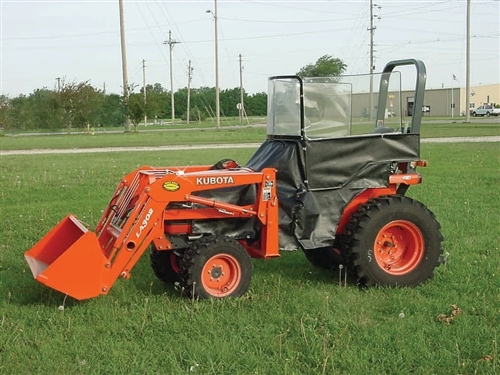 Please see the list, below, for the specific Kubota B-Series models for this weatherbrake. Our reinforced vinyl laminate is resistant to ripping or rotting. The vinyl is sewn with nylon thread using double lock seams and reinforced brass grommets. This Weather Brake has a heavy gauge steel frame with a powder coat finish. It has ample shoulder room and the large 3-section wrinkle and distortion free windowshield provides a clear field of vision. The Femco Kubota B-Series Weather Brakes will fit Kubota Tractors with/without 2 post ROPS and fits on models B7410, B7510, B7610, B7800, B2630. This style weather brake is designed for side entry tractors and can be used with or without a loader. The Femco Kubota B-Series Tractor Weather Brake is BLACK!